Fundación Global Nature and the Youth Climate Action Network of Samoa (YCAN) were presented with the prestigious Ramsar Wetland Conservation Awards and the USD 10,000 Evian Special Prize at the Opening Ceremony of the 13th Meeting of the Conference of the Parties of the Ramsar Convention on Wetlands (COP13) taking place from 21 to 29 October 2018 in Dubai, United Arab Emirates. The Spanish Fundación Global Nature received the Award in the “Wetland Wise Use” category. The award acknowledges contributions to the long-term sustainable use of wetlands. Since its inception the Fundación Global Nature has conserved and restored a total of 14,000 hectares of wetlands with an investment of 18 million Euros. The organization has worked on more than 100 wetlands in Spain, eight of which are Ramsar Sites. It has further cooperated on international projects for restoration of wetlands in Columbia, Guatemala, the Philippines, Mozambique, Paraguay, the Dominican Republic, Senegal and Sri Lanka. The restoration of the La Nava Lagoon conducted by the Fundación is the most important milestones in the history of Spanish conservation work. The 2,200-hectare lagoon was drained in 1968. After the recovery La Nava has become again an internationally important nature reserve and resting place for migratory birds. 225 species of birds have been counted – among them 50 % of the species living in Spain. The Youth Climate Action Network of Samoa (YCAN) received the Ramsar Wetland Conservation Award in the “Young Wetland Champions” category. The Award acknowledges a young person or a group of young people between the ages of 18 and 30 who have contributed to the wise use of wetlands. 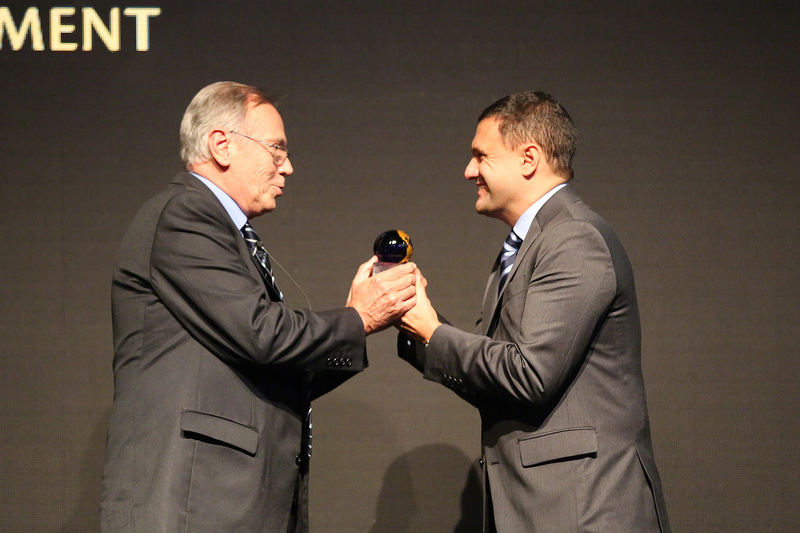 For the first time, the Oceania region has secured such a recognition. YCAN Samoa is a non-governmental organisation which was established in 2015 to encourage community based youth led climate action initiatives that are practical and custom made to tackle climate change threats facing small islands development states (SIDS) in villages and districts of Samoa. The organization’s achievements include mangrove and coral reef rehabilitation. To prevent people from dumping waste in wetlands YCAN installed rubbish stands in villages. At the same time YCAN raised awareness about mangroves and coral reefs’ role in building resilience of coastal communities to extreme weather events and sea rise caused by the climate change. The organization has also carried out river tree planting to help rehabilitate one of the biggest rivers in Samoa and combat erosion. A Merit Award was presented to Mr. Ma Guangren from China to recognize his outstanding lifetime achievement for wetlands adopted in China and Asia. Ma Guangren advocated for a series of wetland conservation regulations by the State Council of China, organized the 2nd National Inventory of Wetland Resources of China and identified the basic status of all wetlands larger than eight hectares. Thanks to his advocacy the Central Government of China invested $1.3 billion to implement nation-wide wetland conservation and restoration projects. Ma Guangren has also set up the National Ramsar Implementation Committee, the China Wetland Conservation Association and has developed networks for the Conservation of the Yangtze River, Yellow River and coastal wetlands, as well as various forms of environmental and public awareness education activities. 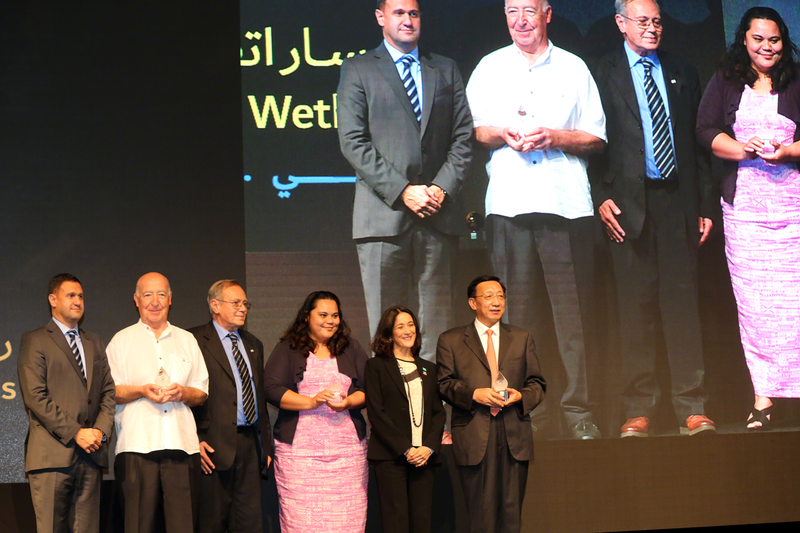 The Ramsar Awards night also marked 20 years of partnership between the Convention and Danone Group. Signed in 1998 it was the first partnership agreement between a global environmental convention and a private company. Within its framework the Danone Group established the Danone-Evian Fund for Water and the Danone Fund for Nature to support the Convention’s work to raise awareness and promote the sustainable use and management of wetlands as a source of water. Since 1998 the Danone-Evian Fund for Water financed an annual global awareness campaign World Wetlands Day and the “Evian Special Prize”, a cash prize of US $10,000 awarded to recipients of the Ramsar Wetland Conservation Awards. In 2008, Danone, the Ramsar Convention and the International Union for the Conservation of Nature (IUCN) created the Danone Fund for Nature to restore degraded ecosystems, redevelop local economies and combat climate change. A notable outcome was the development of a methodology to fund development projects through carbon credits gained from mangrove restoration. This methodology is recognized under the Clean Development Mechanism of the UN Framework Convention for Climate Change. After a successful pilot project in Senegal, in 2011 the Danone Fund for Nature became the Livelihoods Carbon Fund, an independent entity that continues to invest in mangrove restoration, agroforestry and rural energy projects whilst generating carbon credits for its investors. The celebration of the Ramsar Awards and the partnership with the Danone Group comes at a decisive time of COP13 when Contracting Parties to the Convention need to reach consensus on key decisions to protect, restore and sustainably use wetlands. The Convention’s newly released report “The Global Wetland Outlook” revealed that wetlands are disappearing at an alarming rate—three times faster than forests. The 170 signatory governments need to act to adopt policies and practices to halt and reverse the loss of planet’s wetlands. Other notable outcomes of this partnership include development of country projects that generate methodologies on the restoration of wetlands, sustainable management of water resources, and better livelihoods. In 2007 the Evian Water Protection Institute programme was launched and restoration projects completed in Argentina, Nepal, Thailand and Japan. In collaboration with France and Argentina Danone has designated 2 Sites onto the List of Wetlands of International importance namely: Impluvium d’Evian in France designated as a Ramsar Site in 2008 also the source of the popular Evian mineral water and Reserve Natural Villavicencio in Argentina, designated a Ramsar Site in 2017 source of mineral water brand owned by the company. The Site provides important ecosystem services such as food, water and recreation to the community.